Here is the expanded version of the SpeciaLink Early Childhood Inclusion Quality Scale, successor to the 2005 SpeciaLink Practices and Principles workshop version. The SpeciaLink Early Childhood Inclusion Quality Scale is a tool for assessing inclusion quality in early childhood centres and for helping centres move toward higher quality inclusion. The Scale provides a picture of sustainable and evolving inclusion quality — an emerging issue as more children with special needs attend community-based centres and as inclusion pioneers leave their centres and a new generation of directors and early childhood educators take on the inclusion challenges. Over 3000 early childhood professionals have been trained to use the SpeciaLink Early Childhood Inclusion Quality Scale. It has become a mandatory measure of inclusion quality in some Canadian provinces and a recommended tool in others. Comments from many of these consultants and early childhood educators have informed this expanded version, especially the addition of "points of clarification" and "Hints on How to Score More Accurately." Reports from the field indicate that the expanded version is easier to understand and leads to more accurate scoring. The SpeciaLink Inclusion Quality Rating Scale was originally developed in 1990-1992 as a screening tool to help SpeciaLink identify “exemplary mainstream [sic] centres” in each province through a process that involved nomination of programs by key provincial staff, child care professionals and local disability advocacy organizations. Based on extensive reviews of the literature and consultation with researchers, trainers and practitioners, the then 5-item Principles and 10-item Practices measures were used in a brief screening questionnaire to generate a “Mainstream Profile” (Irwin, 1993). Each item was scored on a scale from 1 to 5 based on fairly general descriptions. The scales were substantially revised in 2004-5 and today consist of a 6-item Principles Scale and the 11-item Practices Profile, with specific indicators and scoring procedures based on the ECERS with each item scored from 1 to 7. The Principles Scale is designed to assess a centre’s commitment to inclusion in policy and practice, while the Practices measure is designed to assess the quality of practices used to support inclusion in a specific classroom. Both scales are based on observation, document review and interviews with program staff. The 2005 version was made available as a free website download by SpeciaLink and as a handout at workshops designed to train individuals to use the tool in local communities for self-assessments and in local program evaluations of quality improvement initiatives. An accompanying DVD provides explanations and practice examples for scoring items reliably. In 2009, SpeciaLink released an expanded version, referring to the Practices and Principles as two sections of the SpeciaLink Early Childhood Inclusion Quality Scale. Dr. Donna Lero of the University of Guelph conducted an extensive study funded by the Canadian Council on Learning to examine the psychometric properties of the SpeciaLink inclusion measures based on data collected in almost 600 classrooms across Canada between 2005 and 2008. Analyses included an examination of item and average score distributions, assessments of inter-item consistency and reliability, and a factor analysis. See Evidence Base for more information. As provincial, state, and municipal governments make progress in increasing the number of children with disabilities in inclusive programs, the need for a method to determine the quality of their experience and the capacities of programs to support inclusion has become critical. An effective, reliable and user-friendly tool to assess inclusion quality is required for several purposes. Those purposes include 1) research on children’s experiences in inclusive programs to assess short and longer-term impacts and contribute to evidence- based policy and practice; 2) program evaluations related to alternative funding and support models and professional development; 3) self-assessment for programs seeking to improve their effectiveness; 4) the development of inclusion quality standards, and 5) public accountability and policy evaluation. “Assessing Inclusion Quality in Early Learning and Child Care In Canada with the SpeciaLink Child Care Inclusion Practices Profile and Principles Scale" is a report prepared for the Canadian Council on Learning by Donna S. Lero, Ph.D. Jarislowsky Chair in Families and Work Centre for Families, Work and Well-Being University of Guelph (2009). This report describes the process followed to examine the internal reliability and structural properties of the SpeciaLink Inclusion Principles Scale and Inclusion Practices Profile – two measures to assess inclusion quality, and provide initial evidence of their validity. This report provides strong evidence for the utility and reliability of both SpeciaLink Inclusion measures when used together as measures of inclusion quality. In addition, the validity of both measures is supported. Scores on the SpeciaLink Inclusion Principles scale discriminate effectively between classrooms in inclusive centres, and scores on the Inclusion Practices Profile strongly discriminate between inclusive classrooms and classrooms that do not have any children with identified special needs. Both measures predict director’s ratings of how well they feel their centre is doing in including children with special needs. The SpeciaLink Inclusion Principles Scale assesses the extent to which early learning programs have consciously adopted a set of principles that reflect a strong commitment to include all children in the community, to ensure their full participation in the program, and to support their parents as full partners. The SpeciaLink Inclusion Practices Profile assesses the extent to which physical and human resources are in place and parents, staff, and external professionals work together to ensure that each child’s individual needs are met, while promoting full participation and positive social interactions within an early learning program. Now Senior Researcher for SpeciaLink, Sharon was the founding Director of SpeciaLink and managed it for 17 years, after leaving the fully inclusive child care centre that she pioneered in order to promote high quality, fully inclusive, accessible child care across Canada. Her passion for fully inclusive child care grew as she watched families struggle to maintain their own employment while parenting children with special needs. 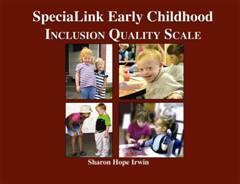 This DVD trains viewers in the use of The SpeciaLink Early Childhood Inclusion Quality Scale. The Scale is a critical tool for assessing inclusion quality in early childhood centres – a major issue as more and more early childhood centres commit to including all children with special needs.